The truth is that we are in the jungle and we do have a special place. Getting to our Personal Jewel in the Jungle. As is customary, I picked up our guests, Keith and Dana at the ferry dock. They arrived from Roatan on the Galaxy Wave ferry at 3:30 p.m. It took them a while to collect all their bags. The Ferry operation is outstanding; but they do need to work on the baggage collection. After meeting with them, we headed towards the Cangrejal River Valley. In total, we travel a distance of about 8 miles from the ferry to La Villa de Soledad. Although a short drive, most of it is on a dirt road, which delays the arrival a few extra minutes. En route, it is normal for guests to reach a state of awe with the lush jungles and lovely river. About ten minutes after boarding the car, we are in a jungle road which follows the Cangrejal River. There is a dense forest coverage on both sides of the river. To the right is Pico Bonito National Park, to the left is Nombre de Dios National Park. It is easy to wonder where the heck it is you are headed for! Keith shared with me that he did at one point ask himself if he had selected the right property to stay in. It seemed like we are on our way to a remote location, and the dense jungle made him think he would need to rough it out. He was looking for a nice place in the jungle, but was not particularly excited about rustic lodging! 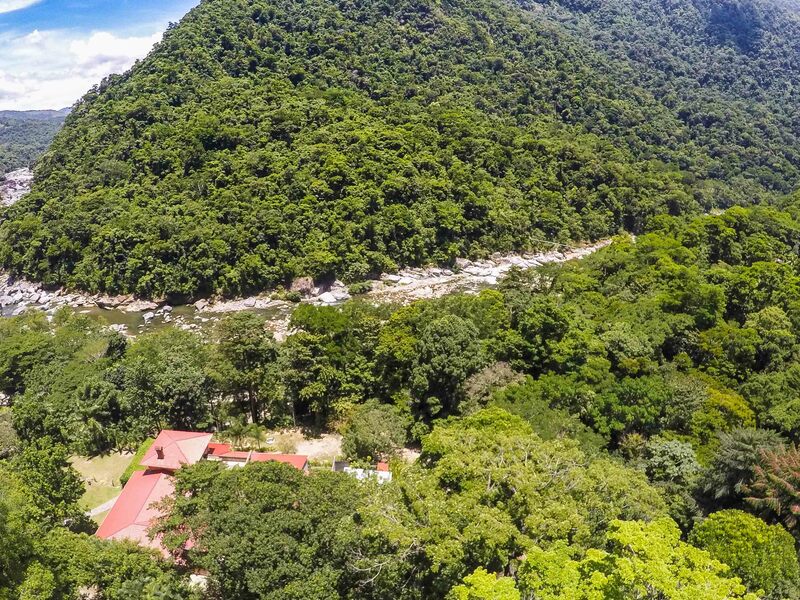 Nestled in the tropical jungles of Nombre de Dios and Pico Bonito National Parks. After about 20 minutes up the Cangrejal River Road we arrived at our destination. A steep drive up the hill usually gets our guests wondering if the car will make it up. The truth is you do need a four wheel drive vehicle to make it up. Half way up the hill you finally are aware of the place you chose to stay in. 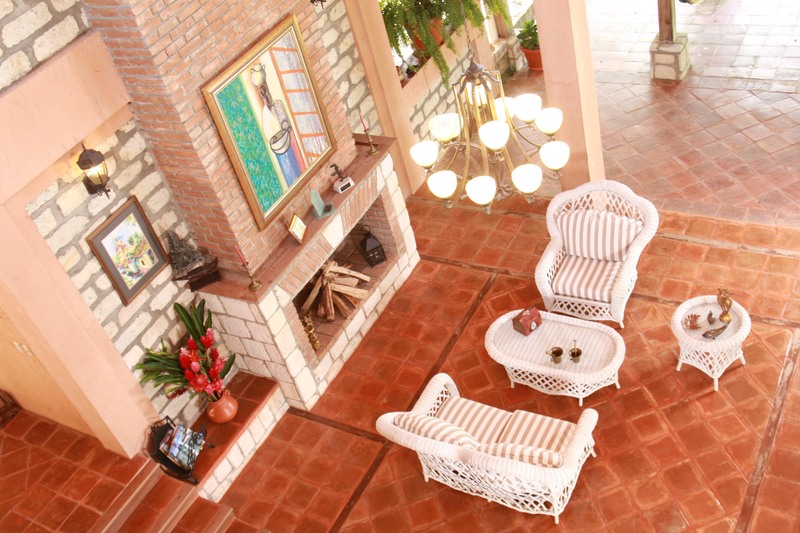 Our lovely Hacienda style home sits on a small bluff overlooking the Cangrejal River. It also faces the lush green mountains of Pico Bonito National Park. I love it when guests finally walk into what we call our living room and acts as the lobby for our Bed and Breakfast. High cathedral ceilings and open porches blend into the natural surroundings. They always draw some awe inspired sighs! “Wow”, and “Oh My God” are common expressions when our guests walk in. Our living room / lobby features a stately fireplace and extra high cathedral ceilings that blend into the natural surroundings. We are proud of the photos that we have in our website, but the general consensus is that we need better photos. What we have does not do justice to our property! The truth is that we are proud of our jewel in the jungle. We love seeing the impression on our guests faces when they first arrive! It does make for great first impression! Of course, we work hard to keep that good impression throughout their stay. So now you know… if you are looking for a special place in the tropical rain forests of Central America. Consider staying at La Villa de Soledad Bed and Breakfast in Honduras. You will find that it is a true jewel in the jungle. Go ahead and book now, to make sure that you can enjoy this lovely paradise that we call home!